Using baking soda is a simple trick that you can use to prevent a serious blockage. If a blockage is ignored, over time it begins to build up, causing problems that can cause more damage and are more expensive to rectify. It is important to call a drain technician as soon as you notice something wrong, but there are ways that you can prevent a serious blockage occurring, saving yourself time and money. Baking soda is an easy, cheap way to prevent your drains from becoming blocked, and is also a great method to use as regular maintenance for your drains. Think it might be too late for this method? Call Blocked Drain Bristol now for all your drainage needs. To unclog a blockage, begin by pouring a pot of boiling water down the drain, and add half a cup of baking soda. Leave the powder to sit for a few minutes before adding a mixture of hot vinegar and hot water. Cover the drain with a plug if you have one, and leave for 5-10 minutes. Flush once more with hot water. The baking soda and hot water will loosen up any debris that has built up in your drains, and the reaction of the soda and vinegar will jerk this build-up completely loose. If this is the first time you have cleared your drains, or if it has been a long time since you last cleaned your drains, you may need to repeat the process a few times. You can also use one cup of baking soda and half a cup of salt. 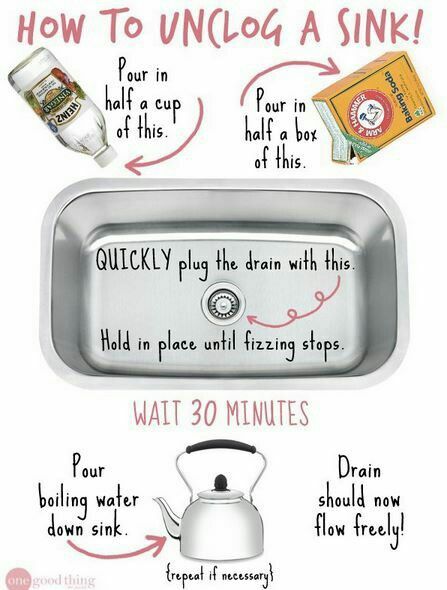 This method is best used overnight, as the mixture needs to be left to sit before being flushed away with hot water.